Spotify is a must have app for all music lovers, it has completely reformed online music streaming industry. Assisting users to create, backup and share playlists is undoubtedly the best feature of Spotify online streaming service. But managing Spotify playlists could turn out to be an extremely complex tasks especially for oafs like me. I always struggle to properly manage all my Spotify Playlists, sometimes accidentally deleting songs or entire lists and at other times find it hard to backup instantly new songs and playlists. There are many others who want to known an easy way of recording, exporting and backing up Spotify playlists. After testing various methods, here i am going to show you how to record Sporty Music, Backup Spotify Playlists and Export Playlists on Windows 7/10/8 & Mac PC and laptop. Spotify is the first choice of millions when it comes to enjoying quality music through its diverse playlists. Below are the top 10 best Spotify Playlists of all time, click on links to become a member. Now that you known some of the biggest Playlist hits on Spotify, lets see how you can recover lost or deleted Spotify playlists, how to back them up and how to record music from Spotify on Windows 7, Windows 10, Windows 8/8.1 & Mac OS X PC/Laptop. Methods below work on desktop PCs and laptop. Android, iPhone or iPad users would not be able to implement instructions below on mobile devices. See step-by-step instructions below to record free Spotify online music on PC or laptop. 1 – Download TunesGo tool and install it on PC. 2 – Launch TunesGo software on computer. 3 – On the top of the interface, click on the tab named ‘Record’. 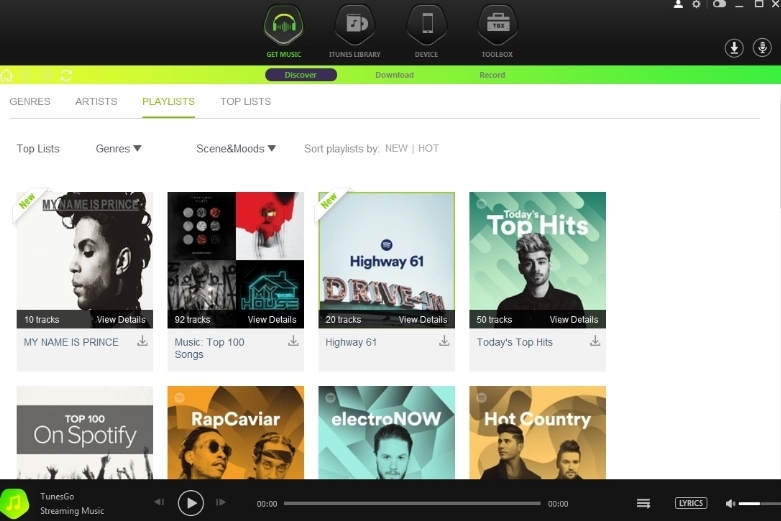 4 – Login with your Spotify account on TunesGo and play any soundtrack or playlist that you would like to record. 5 – Now click the ‘Record’ Button on TunesGo to start automatic song recording. Click the Record button again to finish the recording. If you have iTunes installed on Windows or Mac then recorded songs would also be saved on to your iTunes Library from where you can play them anytime for free. Open Spotify on Windows PC or Mac. Now open a new Word Document. Put Spotify and Word document side by side on the desktop screen. Select all those songs that you want exported on Spotify and drag/paste them on the Word document. All song names would be pasted as hyperlinks. In future whenever you want to open that song, track or playlist, simply click on its hyperlink that you just saved on the Word document to play it directly on Spotify web version on PC. Download Spotify Playlist Extractor plugin and add it to Google Chrome by hitting ‘Add to Chrome’ button on the upper right corner of the interface. You should now see a small icon added to the extension area on Chrome browser window. Now open Spotify Web Player and login. Click on Playlist option and select your favorite playlist from the list. Next, click Spotify Playlist Extractor icon on Chrome browser and wait for it to extract playlist. If your playlist has multiple items, the extractor plugin will automatically scroll through them all one by one and when its done, you should see a new tab containing formatted playlist items. 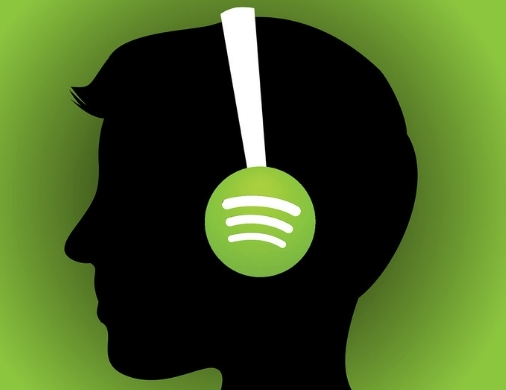 1 – Download Spotify on PC. Follow on-screen instructions to install it. 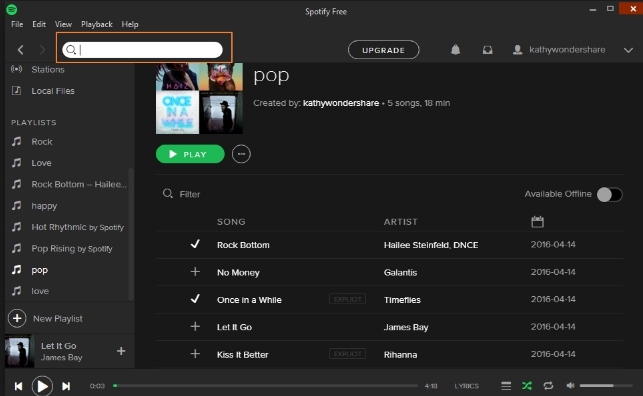 2 – Open Spotify for PC app and select the playlist that you want to copy. You should also see a list of songs in the selected playlist. 3 – Click on the track or press (Ctrl + A – Windows) & (Command + A – Mac) keys to select multiple songs in the playlist. This will highlight all songs ready to be copied. 4 – Right-click on any of the selected songs and go to Add To > New Playlist from the drop-down menu. Give playlist any name you like. You can also merge one play list with anther with this method; when you go to Add To option on drop-down menu, right under New Playlist option there will be a list of existing playlists, simply select any one of these to merge newly selected playlist with the existing one. This methods allows you to add multiple songs or merge multiple playlist quickly without having add song or playlist one by one. You can find endless best trending and popular Spotify playlists carefully culled and customized by music experts along with those uploaded by users from around the world on topsify.com and playlists.net. You can Google current trending Spotify playlists, or use Spotify’s own app browser and ‘new section’ to find playlists by categories and recent uploads.